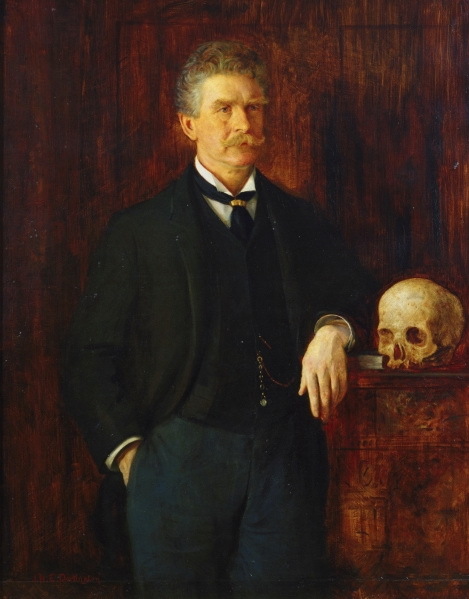 Whatever Happened to Ambrose Bierce? Witty, prickly, bitter and brilliant, for 50 odd years, author and newspaperman Ambrose Bierce eloquently chronicled the latter half of the 19th, and first few years of the 20th, centuries. From moving descriptions of Civil War events, to scathing rebukes of the worst of the Gilded Age, all interspersed with tales of the supernatural, Bierce’s unique voice has left us with a body of work rivaled only by the greatest American writers. Yet despite his virtuosity with a well-turned phrase, perhaps the most enduring aspect of Bierce’s life is the way he died – because nobody knows for sure how he met his end. Bierce considered birth as “the first and direst of all his disasters,” his occurring on June 24, 1842 in southeastern Ohio. By the age of 15, Bierce was in Indiana where he had taken a job as a “printer’s devil” for the abolitionist newspaper, the Northern Indianan. At 17 years, he enrolled in the Kentucky Military Institute and two years later, at the onset of the Civil War (1861-1865), he enlisted with the Ninth Indiana Infantry as a topographical engineer. Nonetheless, it wasn’t all misery, and shortly after the end of the war, Ambrose began his newspaper career as a columnist and managing editor for the San Francisco News-Letter in 1868. Over the next several decades, Ambrose’s biting and satirical observations as well as his masterful short stories were published widely including in publications like Fun, the London Sketch Book, Overland Monthly and Figaro. In 1886, Bierce went to work for William Randolph Hearst’s San Francisco Examiner, where he remained until 1909. The trail of the young man had abruptly ended, and all beyond was smooth, unbroken snow. . . . Four days later the grief stricken mother [was] passing the spot where the footprints had ended [and] she heard the voice of her son and had been eagerly calling to him . . . For months afterward, at irregular intervals of a few days, the voice was heard [and] all declared it unmistakably the voice of Charles Ashmore . . . [that] seemed to come from a great distance, faintly . . . . The intervals of silence grew longer and longer . . . and by midsummer it was heard no more. Toward the end of his life, Bitter Bierce had become completely disenchanted with this world. Having never reconciled with his wife (who sued him for divorce in 1904 and died in 1905), Bierce was miserable, having also outlived both of his sons (one died as a teenager as part of a lover’s triangle, and the other from pneumonia aggravated by alcoholism). Alone and aging, “the thought of turning into a doddering old man waiting out his final years was reprehensible to him.” With the Mexican Revolution raging south of the border, the 71-year-old Bierce left, ostensibly to observe or participate in the war. His last letter was posted in Chihuahua, Mexico on December 26, 1913, after which there are no confirmed sightings. Good bye. If you hear of my being stood up against a Mexican stone wall and shot to rags please know that I think that a pretty good way to depart this life. It beats old age, disease and falling down the stairs. To be a Gringo in Mexico – ah, that is euthanasia! In support of their “death wish” theory, some claim Bierce was “preoccupied with death and dying” as evidenced by the macabre route he took to Mexico, which included visiting a number of the battlefield sites where he had witnessed so much carnage during the Civil War. Bierce could stand on a precipitous rim, raise his trusty gun to his head, and allow the bullet to do its work. Detractors of this theory note that he would have to have relied on someone else to mail his letters from Mexico, and the fact that nothing of his remains have been found by the 100 million or so visitors to the park in the intervening 90 years. In the December 26 letter, Bierce wrote that he intended to join Pancho Villa’s revolutionary army as it rode to Ojinaga, Mexico. At least one soldier reported seeing Bierce with the army before the battle on January 10,1914, but not after, leading some to conclude he was killed at Ojinaga. Never made it to South America, but was captured in the wilds of Mexico, where primitive native tribes boiled him alive; his shrunken remains then became the objects of tribal idolatry. A later Central American explorer [who] claimed that he came across an old, white-haired man clad in animal pelts who was being held by a native tribe that at once revered him as a god and forbade him any movement. During the retreat from Ojinaga to Presidio, Texas, [they] met an old norteamericano. The gringo was ill and not able to speak well, but it was determined that his name was “Ambrosia” and that his last name was something like “Price” . . . . The . . . soldiers put the gringo on a two-wheeled cart and helped him to . . . Marfa, Texas. . . . By the time they arrived . . . the old man was delirious and . . . he died shortly afterward. Well, the Marfa Texas story SHOULD be fairly easy to substantiate or disprove. Not only do I not live far from there, but they only have a few people, a couple hundred tarantulas, thousands of rattlers, and killer bees like the sands of the Chihuahua desert itself. Shouldn’t be hard to find a marked grave that says ‘Ambrosia’…if they marked it. I was under the impression that Bierce walked out into the Mexican desert and disappeared never to be seen again.